A couple of years ago I decided to finally try using an online travel search engine to book a flight. I compared a number of travel search engines to find the easiest one to use. I’ve been using it ever since. I think there may be a couple of lessons to be learned about Usability and Stickiness. 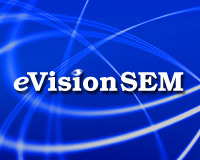 Now in our 10th year, eVision has been helping organizations improve results from search marketing and related areas of online promotion while helping our clients improve the conversion rates of the websites. Working with large and small companies in the U.S. and abroad over the past decade, I’ve seen a lot of what it takes to be successful in online marketing. I’ve also seen the pitfalls. Here are some of the “initial” keys to online marketing success.